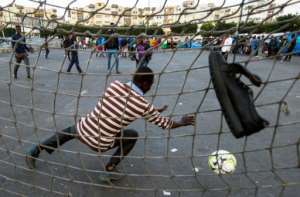 The rubbish had been cleared away and spectators emerged from makeshift tents: it was time for kick-off in the daily football game at the Oulad Ziane migrant camp in Morocco's Casablanca. "We organise ourselves among the different nationalities," said Djabel Niang, 21, who left Senegal two years ago to pursue his dream of crossing the Mediterranean and playing for Real Madrid. "We play in teams of five or six in conditions that aren't really up to scratch, but we play anyway -- we play for pleasure, and to forget." The camp, near the central bus station in Morocco's coastal commercial capital, is home to migrants from sub-Saharan Africa who are trying to reach Europe or have been forced back. The population fluctuates between a few dozen and several hundred, and the small football pitch on the edge of the tent encampment is a key focal point. The different communities -- from Mali, Burkina Faso, Senegal, Ivory Coast, Cameroon and Guinea -- each have their own "president" and team. The best-equipped squads wear old jerseys bearing the colours of AC Milan, Real Madrid, the Moroccan national team and local club Wydad Casablanca. The others make do with whatever they can find. 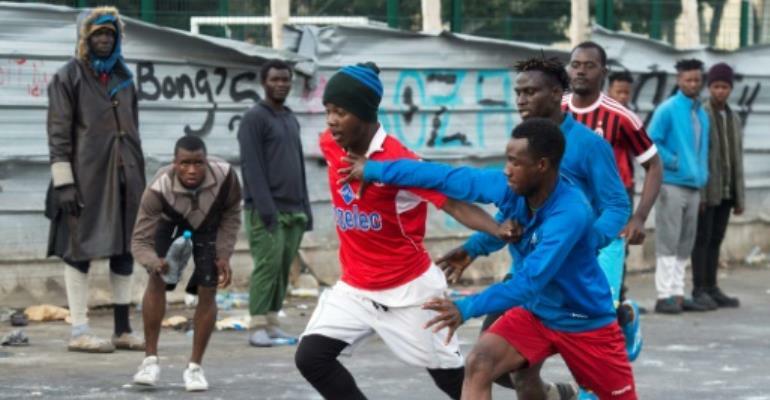 "It isn't easy to get football kits, we don't have jobs or families," said Niang. Like all those in the camps, the footballers live from hand to mouth and try to avoid drawing the attention of constantly passing police patrols. Relations with the Moroccans living nearby are also complicated -- some bring clothes or food, but others resent the presence of the migrants and sometimes pick fights. The football matches are a way to forget the tough situation. "We train every day, every evening," said midfielder Chancelin Njike, 25, from Cameroon. To signal a foul during games, the referee hits the ground with a plastic bottle, for lack of a whistle. Along the edge of the pitch, petty traders continue plying their wares, a cook mixes up semolina, a carpenter hammers away and street children sniff glue. At one recent match, the Guinean team chalked up a 2-0 win over Cameroon, who were hampered by the fact that two of their best players had been sent by security forces to the southern city of Agadir. "Often we organise small tournaments to create some atmosphere, and other times we just play for fun," said Njike. He used to play in Cameroon's third division and graduated from a sports academy, but left the country in 2015 to head to Europe. "It is my hope to get in to be able to train, play and reach a good level one day," he said. But he has not been lucky. As he talked about his journey, his voice trembled. For months he lived in the forests of northern Morocco, but could not find a way to breach the tall border fence that divides it from the Spanish enclave of Melilla. He nearly drowned twice attempting perilous sea crossings. Two of his friends didn't make it, dying during a voyage on an overcrowded dinghy. He said two classmates from his football academy had reached Europe and ended up playing football in France, inspiring him to attempt the same path. He said he has come to realise that is just too hard: now, he has had enough. "I have lost two years of my life," he lamented. 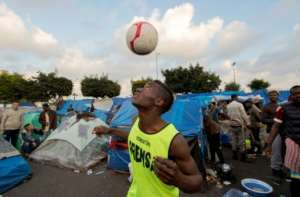 But Constand Ndassongue, also from Cameroon, said he has made "three attempts" to reach Europe. The 19-year-old left-winger's aim is to "be able to play for a big club one day". When he is not playing, he dedicates himself to training, refusing to give up on his hopes of making it big. "I don't care what country it is, as long as I can shine," he said.